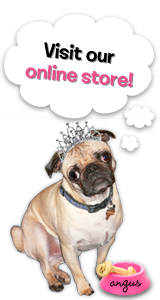 Happy Weekend Everyone! 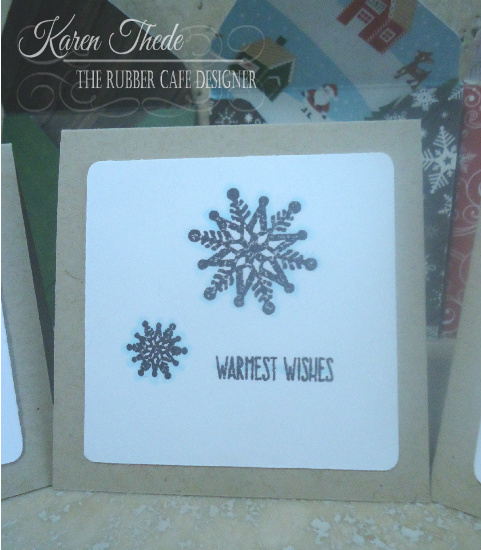 - Today I'm posting my first project using our latest kit from the Rubber Cafe'! called Creating Christmas- so appropriate, for this amazing kit as it's filled with wonderful stamp images, and the perfect 6x6 pad from Echo Park to provide you lots of inspiration. Here's a look a my notecard set. These little sweeties are too cute measuring 3 inches square, and have their own matching envelopes as well, these would be great to put on any package or gift of any kind! Since the printed paper pad from Echo Park's - Christmas is coming, is printed on both sides, when you make your envelopes they will be as if they have their own customer liner. 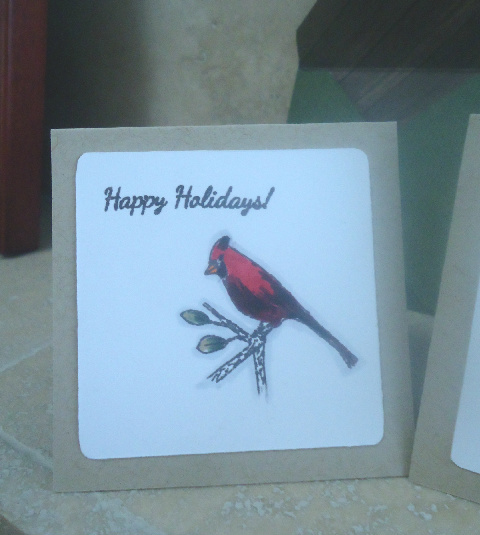 These smaller images were perfect for these little cards so I couldn't resist creating more than one. First - I have this beautiful Cardinal - stamped in Memento Espresso Truffle; I just colored in my bird using Copic markers. 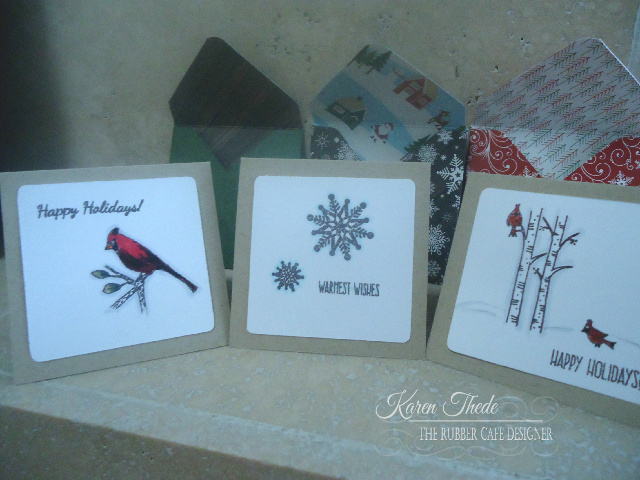 I rounded the corners on each and used Kraft cardstock for each 3x3 card. Keeping these super simple you'll be create several in very little time! Next up - is just a couple of simple snowflakes still using Memento Espresso Truffle these coordinate perfectly with the printed snowflake paper with the white snowflakes on a rich dark brown background. 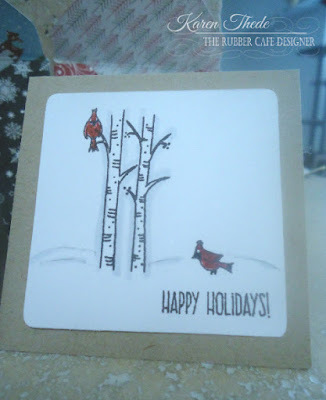 My last notecard is the birch trees with 2 adorable birds, resting and getting the perfect birdseye view to keep watch while her mate is on the ground 'caching' for food. 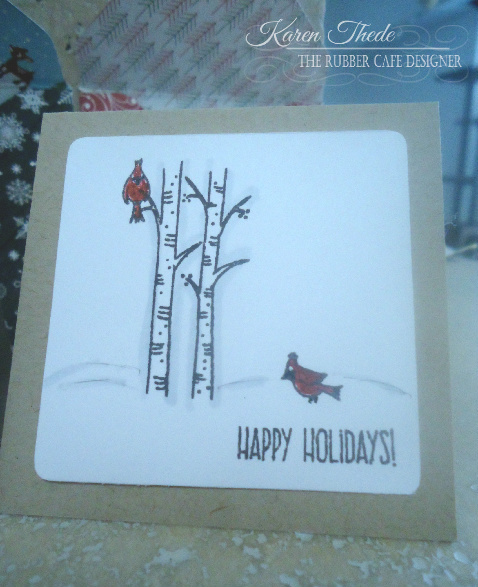 Again very simply stamped the spot of red, make this little card pop! To create my envelopes I used my envelope maker - it is a 5 3/4" square cut and scoring each corner around these go together very quickly. There are lots of simple phrases to choose from to finish off each notecard that can be put on the inside as well as the outside. 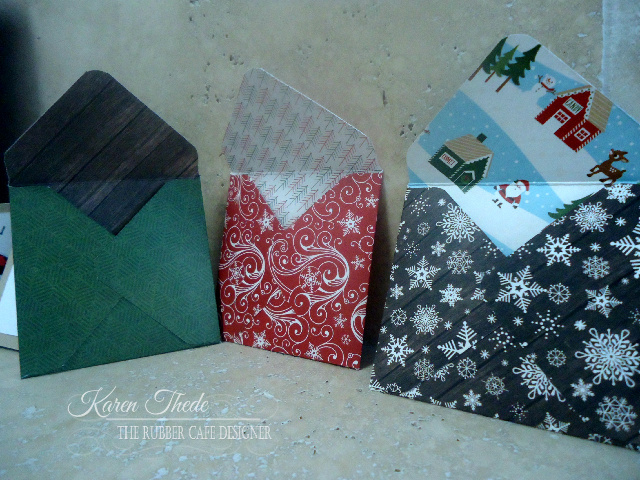 Stamps: The Rubber Cafe'- Creative Café kit -Creating Christmas- add-on set Heart of the Season; and Christmas is coming.